Everything in Czech has a gender! 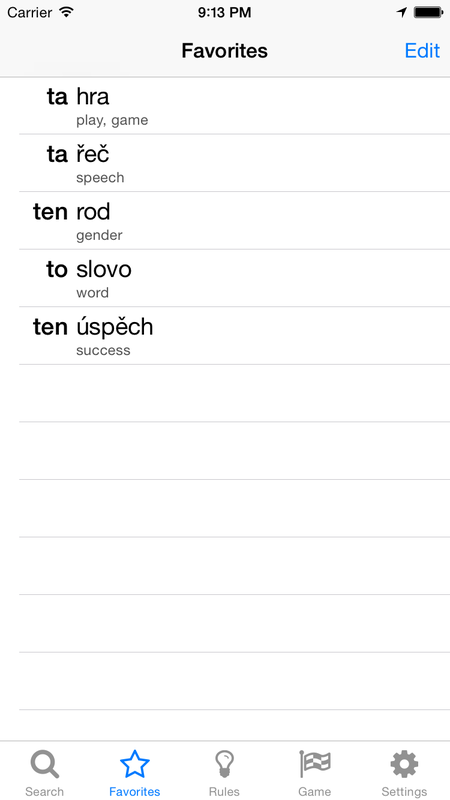 This is a friendly iOS app for quickly looking-up and practicing Czech nouns and their gender. Rules - The most complete color-coded summary of Rules and Guidelines to determine the gender of Czech nouns. Search - A quick Search of a noun's gender by just typing the first few letters of the word. 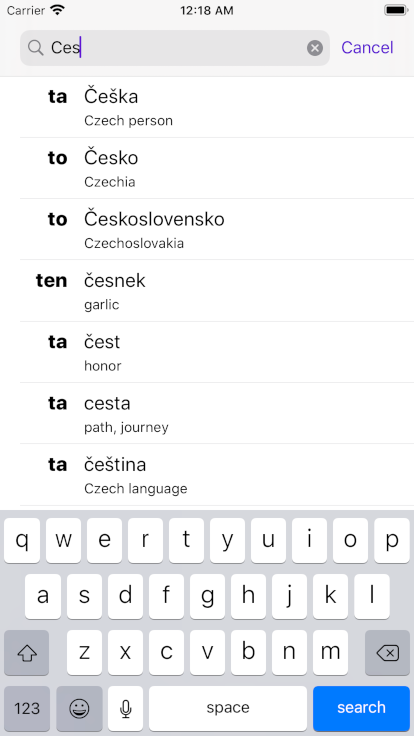 With an Internet connection, you can learn more about a selected noun and its practical usage by clicking Show Definition and accessing the Czech Wikislovnik dictionary. The Game – To practice the rules play the Game. 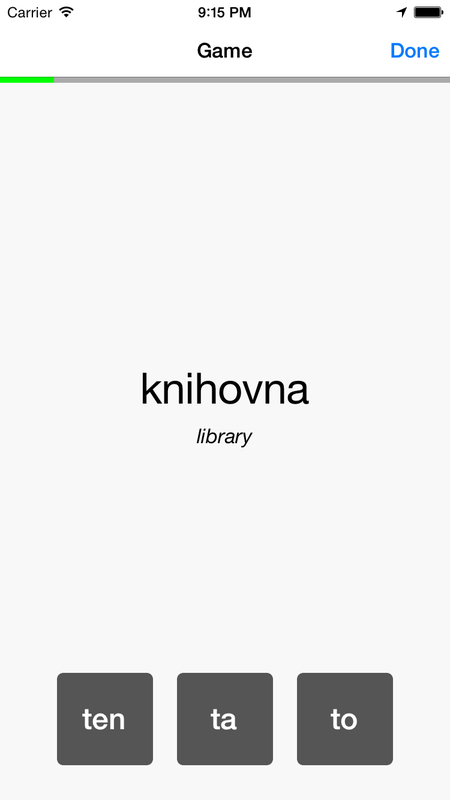 Choose the gender of 4000 randomly presented Czech nouns with 3 levels of difficulty. Adjectives in the answers and the English translation of the nouns will help you remember them faster. 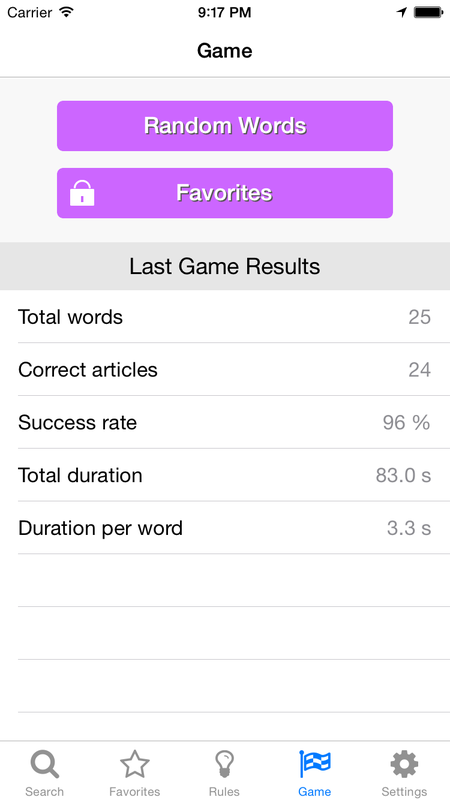 Incorrectly answered words are recycled back into the game. You can follow your progress in Game Results. Favorites - To focus on problematic nouns, add them to your list of Favorites for later review. Linguistic content by Suzanna Halsey / CzechMatters. App icon by OAX Graphic Design. 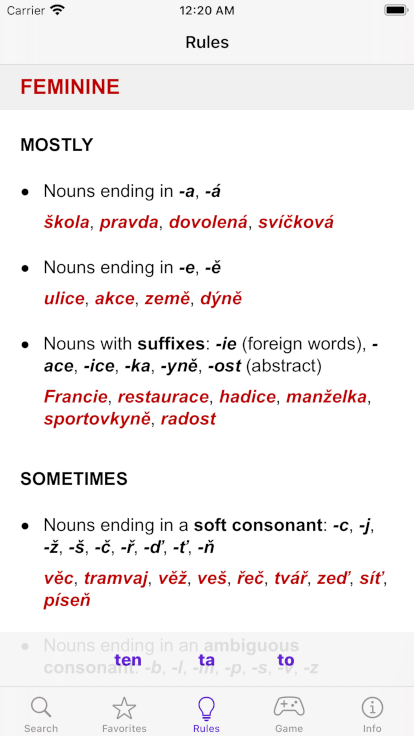 The 4000 most frequent nouns with grammatical gender information presented in this application are derived from the Corpus SYN2010 and compiled by the Institute of the Czech National Corpus (ÚČNK), Faculty of Arts, Charles University, Prague. This project was made possible by grants from the Czech Ministry of Foreign Affairs’ Grant Program for Czechs Living Abroad, the Adjunct Professional Development Fund at New York University and the Czechoslovak Society of Arts and Sciences in New York; and by generous donations from Ludmila Schwarzenberg Bidwell, Josef Baláž, Alison Lukes, Eugenia and David Askren, Susan Justman and Libor Mraček. We appreciate the kind support from Joseph Bistricer, Martha Stasa, Ruth Davis, Patricia Mikes, Signe Myhren, Marc Rubenstein, Pavel Ort, Suzanne Pergal, Kleno Photo, Lída Cope and Adriana Romano. Special thanks to: Václav Cvrček (ÚČNK UK), Dana Hůlková Nývltová (ÚJOP UK), Lída Holá, Jacy Meyer, Halina Bren, Petr Dubecký, Helena Fišera, Vít Hořejš, Jitka Volavka Illner, Kim Halsey and Adam Mikušiak.